In summer 1941 the Institute was completing a regular academic year. But the War broke well-formed pace of original life. 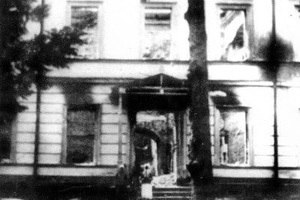 At daylight, June 22, first bombs fell on Zhytomyr as well as to many other cities of the country. The same day a meeting took place at the Institute. Protesters blamed invasion of Nazism and made an oath to give their energies and even lives for the Motherland. Vast number of claims from professors and students to send them to field forces began coming in. Hundreds of the Institute’s educatees joined the ranks of the Red Army and the Fleet in the very first days, signed up for citizens-in-arms; ambulance and mopping-up detachments were formed from their body. Last state exams were passed under bursts of enemy bombs. And graduates with Teacher’s Diplomas didn’t make their ways to classrooms but stood to arms and sallied to pass the most honorable and difficult exam, the allegiance to homeland one. Many of them joined mopping-up detachment which recognized and moved down enemy emissaries and subversives. O. O. Pavlovskyi, professor, squadron leader, was in charge. Staff headquarters of the detachment was located in a hostel (now the university’s Hostel № 1). The university’s building was urgently refurnished into an army hospital with graduates as orderlies. July, 5, a mass hostile shelling of Zhytomyr began. Many students along with citizens of the city made their way on foot eastward to escape fascist enslavement and then joined field forces. An army hospital was sent by serial. I. V. Perchuk, professor, medical service commander, worked at a hospital under severe environment of evacuation. The last to leave Zhytomyr were O. K. Kasymenko, professor, later known scientist-historian of Ukraine, principal of the NAS institute of history of USSR, B. D. Surkis and S. L. Blyzniuk. During the Great Patriotic War one could meet professors, students, fellows and graduates of Pedagogical Institute at the lines, in guerilla regiments, conspiracies and underground groups across temporary occupational territory. O. P. Boiarko, Vice-rector of the Institute, led Chernivtsi covert regional party committee, Y. O. Kovmir, second Vice-rector, was a commissioner of a guerilla command, graduates H. P. Mishchenko — subversive raiding force leader, Volodymyr Plotnyts’kyi — Zhytomyr region youth conspiracy member. 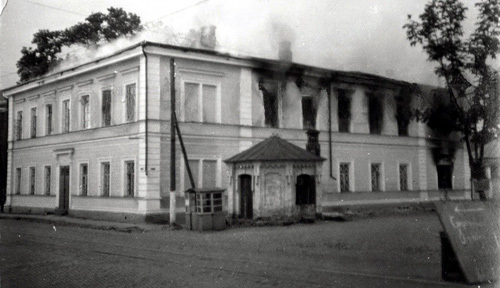 The fact that the third-years of the Faculty of History alone got 68 orders and more than 150 military medals speaks for great deeds of students of Pedagogical Institute during the War. Perseverance and courage may be also exemplified by a combat record of student of correspondence school, commutation agent of Zhytomyr covert regional party committee Maria Tyshkevych. The girl together with her sister forged documents, and counterfeited masterfully fascist officers’ signatures thereby saved many young people from forced labor in Nazi Germany. She got caught in fascist torture chambers but no torture made her disclose the underground. Maria met her death as heart-whole patriot. She’s buried in the bed of honor at Bohynia. Hundreds of students, dozens of professors and fellows of the Institute died like heroes for honor and independence of their Motherland. A. V. Pavlovskyi, Rector of the Institute, O. P. Boiarko, V. P. Vynohradov, Vice-rectors, and H. P. Yemsenko, S. T. Parkhomchuk, headmaster of the Faculty of Workers, professors B. D. Surkis, V. D. Dobryvechir and others died. The Institute’s family keeps sacredly cherished memory of them. A memorial sign in honor of professors, students and fellows fell before the enemy for the native land in 1941–1945 was established near the main building. Night January, 1, 1944 the city was released from Nazi conquerors. M. S. Bovsunivskyi (later associate professor of the Department of History and Political Economy), P. K. Serbin (professor of the World History Department), O. O. Boiko (associate professor of Ukrainian Literature Department), I. T. Yarosh (senior professor of the Department of Pedagogy) were among its releasers. After the release Zhytomyr was in shambles. Campus buildings of the Institute with its cabinets, laboratories, library, professors’ dwellings, and hostel were ruined. But from the very first government of Ukraine and local authorities took steps to restore the higher educational institution. As early as in summer 1944, professors and fellows were hired; admission of students was brought into action. September, 1, 1944, the Institute opened a new academic year, the first one after release. It comprised 9 departments with 31 professors. Two faculties were started. These were the Faculty of History and the Language-Literature Faculty including Ukrainian and Russian with Literature Office. Being affiliated with Pedagogical Institute a training-school worked with the same faculties under separate program. V. V. Chupryna was appointed as Rector of the Institute, Y. A. Kovmir and I. I. Shaniuk — as Vice-rectors. The same time new professors arrived to the Institute. These were M. I. Petrovskyi, Associate Professor, later Head of the Department of Marxism-Leninism, D. A. Kolomiiets, Head of the Department of Ukrainian Literature, O. M. Semenova, Head of the Department of Foreign Languages, M. M. Lapshyn, Head of the Department of Military Education, professors S. I. Losiev, M. P. Bershii, T. M. Rybakov, N. M. Baryshpol’ and others. This was the year of second birth of the Institute. 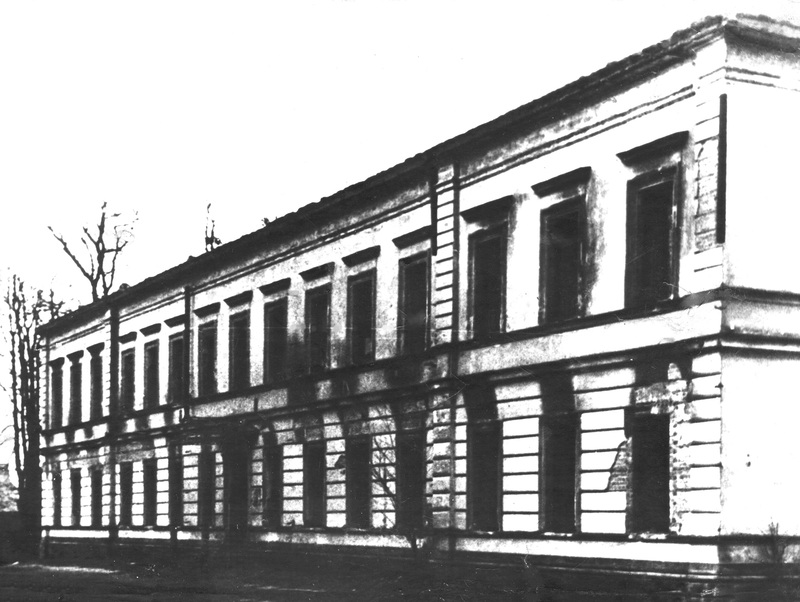 At first the higher educational institution stationed itself in a basement of agricultural college, then — in the building of Zhytomyr School № 20. Staff included one professor and four associate professors, others didn’t possess academic degrees and titles. There were 168 students attended full-time education and 545 — correspondence study. The Institute ran under extremely difficult conditions in early port-war years. Without any light and heating, there in lecture-rooms with nailed-up windows lectures, tutorials, theses arrangement took place, scientific reports were delivered. Students listened to lectures and made notes sitting on earthen floor. There was a lack of 16 professors, training equipment, lecture-rooms, and dwellings for employees, hostels for students. Professors and students made tables and desks, set doors and windows all by themselves. Much work was done by the staff to restore library headed by N. V. Kozlovska. After victorious end of the Great Patriotic War the country experienced pressing need in teaching personnel. This set new tasks for pedagogical higher educational institutions to solve. According to Y. Y. Fialko, new principal reporting to Ministry of Education of Ukraine (1945), 453 students attended full-time education including 46 disabled veterans. As if great achievements there in the report was indicated that all windows were already paned and there are double frames indeed; students have got sheets though there were no pillows. By their own efforts, professors and students reconditioned academic building, stored up wood for the winter, gathered the harvest in a part-time farming, and took part in cleaning and forestry of the city. In 1946, Y.O.Kovmir was appointed as principal of the Institute, P. T. Markushevskyi — as Deputy Director for studies and research work, S. T. Radchuk-Pavlenko was put as Director of the Philological Faculty, K.O.Kyseliov — as Director of the Faculty of History. In 1947, the Department of Russian Language was headed by M. B. Khramoi, the Department of Pedagogic — by N. I. Mykhailova, the Department of Modern History — by L. A. Kovalenko, Candidate of historical sciences, and the Department of Russian and World History — by S. T. Radchuk-Pavlenko. Gradually, living, working and learning environment in the Institute improved. In 1948, the Faculty of Mathematics and Physics including Department of Physics and Department of Mathematics resumed its work after 16-year interruption. V. M. Kostarchuk was its first Principal. In 1949, the Faculty of Foreign Languages started its work and soon detached to become an independent institute. In 1950, contingent of students exceeded 2 thousand people. There were 770 attended day-shift education and 1262 — correspondence study. Pedagogue class increased correspondingly. The higher educational institution gave the country 472 specialists; 60% of them got appointments to western part of Ukraine. Educational and scientific-methods work improved. In 1958, IXth volume (the first one after war) of Scientific Notes (physico-mathematical line) was issued. L. A. Kovalenko, associate professor, V. M. Prylypko, V. I. Pivtoradnia and B. I. Khatset were quite useful at that time. Their proceedings caught attention of wide scientific public. Professors arranged a number of methodical text-books for students. Among others are the following, O. Korniichuk’s Drama Learning in Secondary School by V. I. Pivtoradnia, abridged course of lectures Old Slavonic Language by T. V. Baimut, associate professor. The Department of Ukrainian Language together with the seniors accomplished an expedition to learn Zhytomyr region dialects. The history of Polissia study became a singularity of professors’ scientific research. Scientific Notes (1957) was devoted to this and comprised research articles on regional matters. During postwar period, up to 1957 inclusive, the Institute issued 7 volumes of Scientific Notes showing research of pedagogical team increased. In 1955–1957, 109 research and scientific-methods papers were published by professors. Over the whole postwar period the Faculty of History consisting mostly of ex-servicemen and guerilla members won priority for academic progress and extracurricular. In 1948–1950, there were 39 excellent students having graduated from the Institute with honors. In a period of 14 years after war, 1.6 thousand students received education in off-work hours. 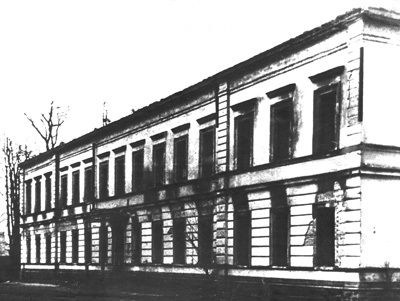 In 1956, the Faculty of History was transferred to Lutsk Pedagogical Institute. Young men and women took active part in social life and household activity. Almost every year they helped collective farms to gather harvest, went to newground, worked at children’s playgrounds and militia rooms, restored central Barton of the Institute, campus buildings, library and canteen. Students’ living conditions improved. In 1954, first hostel for 250 places was ready to allocate students. Book collection of the Institute’s library refilled. Moral support activities developed. Gradually, the main building of the Institute rose from ruin. In 1959 alone, professors and students worked out 48 thousand man-days. What is more, turnpike roads, Recreation and Entertainment Park and athletic field were organized by efforts of future teachers. Staff of the Institute widened scientific and constructive contacts with scholars of different higher educational institutions of the country. Scientists from Moscow, Leningrad, Kyiv, and Odesa lectured for our students. Methodic interchange of Scientific Notes was improved with staffs of Pedagogical Institutes in Vinnytsia, Izmail, Odesa, Mykolaiv, Kamianets-Podilskyi, Chernihiv. Delegations of Zhytomyr State Pedagogical Institute visited higher educational establishments of Minsk, Moscow, Leningrad, Homel, Volhohrad. O. P. Yura-Yuraskyi, Honoured Artist of Ukraine, appeared in the Institute performing his literary recitals. Audiences with such writers as M. Rylskyi, A. Malyshko, V. Kucher, V. Sosiura, L. Pervomaiskyi, M. Nahnybida, V. Kozachenko, S. Oliinyk, H. Boiko, P. Sieverov took place here as well.